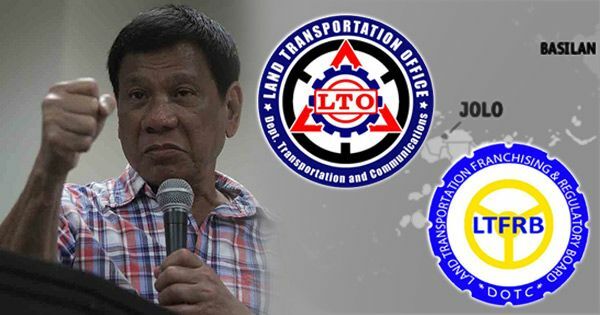 President Rodrigo Duterte will assign corrupt officials and employees of the Land Transportation Office (LTO) and the Land Transportation Franchising and Regulatory Board (LTFRB) in Jolo and Basilan. The Chief Executive, who always walk the talk, issued the warning during a televised news conference from his office in Davao City on Sunday, August 21, according to an ABS-CBN News report. The President also said he is declaring appointive government positions vacant due to corruption. Appointees in government owned and controlled corporations are included. Duterte required heads of the LTO and LTFRB to report to him next week. "I would like to issue a warning that on Monday... I will declare all your positions, all throughout the country vacant. I still hear corruption," he said. "Lahat [Everyone], even numbering thousands, consider yourself in the crucible of the truth about corruption." Duterte told those in the LTO and other regulatory bodies to be prepared to be assigned in Jolo and in Basilan. These areas are known to be war zones and infested with terrorists and lawless elements such as the ISIS affiliate Abu Sayyaf Group. "You will deserve the ambiance, enjoy the environment, you have only yourself to blame for being corrupt," the President said, adding that he hates corruption and doesn't want to give the slightest headache to fellow Filipinos.